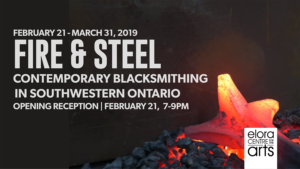 FORGED IN FIRE: This exhibition showcases a collaborative group of artist blacksmiths from across Southwestern Ontario. The collection of handmade objects is a cross-section of functional, architectural and sculptural ironwork. This compelling body of work is an honest expression of what is capturing the imagination of blacksmiths, who make a living hammering hot metal in order to re-shape it into useful, pleasing or thought-provoking objects of art. Participating artist blacksmiths include Mike Armstrong, Wolfgang Bleckert, Aimie Botelho, Megan Carter, David Cross, Sandra Dunn, Bronson Kozdas, Daniel Linkenheld, Darrell Markowitz, Robb Martin, Scott McKay, Mark Puigmarti, David Robertson, Graeme Sheffield and Jim Wallace. To find out more about each artist blacksmith, and view their bios please click here.